In a state visit to India this week Russian Premier Vladimir Putin and Indian Prime Minister Naranedra Modi signed an agreement for Rosatom to build nuclear reactors there. 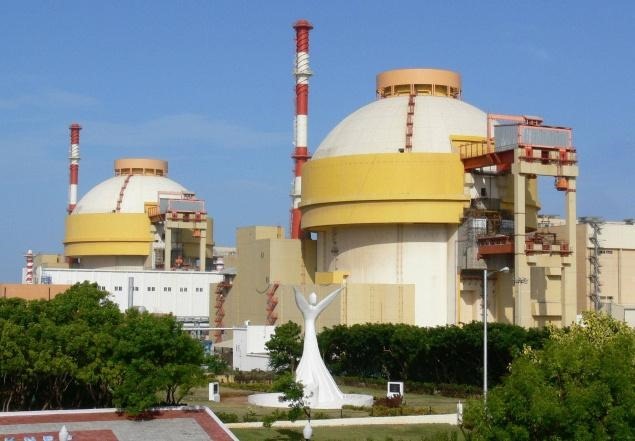 Despite wildly inflated reports in the Indian press that Russia would supply up to 20 reactors, a more realistic assessment is that at a minimum it will build two more units built at Kudankulam (right). There Rosatom recently completed and commissioned two 1000 MW VVERs. Ignored in the hoopla of the joint announcement by the two leaders is that the Russian deal may finally put enough pressure on the Indian government to make substantial changes to a nuclear liability law that has locked all outside vendors out of the country’s market. Domestically, major heavy industry firms have also complained that the law makes the government its own worst enemy. The firms have refused to accept orders for components to support construction of an indigenous design of a 700 MW heavy water reactor. The concept of “localization” for foreign sourced reactors has so far been limited to turbines, steam generators, pumps, and pipes. L&T holds the American Society of Nuclear Engineers’ N-Stamp, the internationally-accepted standard for makers of nuclear-grade pressure vessels and equipment. It has partnerships in principle with Westinghouse to provide components for the AP1000 and with GE-Hitachi for its ABWR reactor. Neither agreement has resulted in any ink on either firm’s order books due to the liability law. Both firms periodically issue progress reports on their respective efforts, but these are all paperwork milestones and do not involve construction. The Russians are rumored to have worked out a secret agreement with India to exempt it from the liability law, but Russian officials, when confronted by Indian news media about it, denied that such an agreement exists. Areva has been negotiating with India over similar issues related to building the first two of six planned 1600 MW EPRs at Jaitapur. Finland’s parliament voted Dec 7 to authorize a 1200 MW VVER (AES-206) to be built by Rosatom for Finnish utility Fennovoima. The 117-74 vote followed an investment decision by Foratom to buy a 15% equity stake in the project which pushed Finnish ownership north of the 60 percent level. First concrete is expected to be poured in 2018. The price tag of the unit will be at least $8.1 billion ($6700/Kw) which is the current estimated cost of Hanhikivi-1 a reactor being built by Fennovoima at a costal site on the country’s western shore facing Sweden. South Korea and the U.S. are still holding diplomatic discussions to renew, and most likely, revise the long standing 123 agreement that enables cooperation on civilian nuclear technologies between the two countries. The agreement, first established in 1974, limits South Korea’s ability to have its own uranium enrichment and spent nuclear fuel reprocessing capabilities. South Korea wants to change that arrangement. The U.S. has resisted these changes due to concerns over the impact they might have on the bellicose and unpredictable North Korean regime. In recent years South Korea has become a nuclear export power house with deals for four reactors in the UAE and three more in Turkey. South Korea is currently positioned to arrange for third parties to supply the fuel for these units and also have third parties take spent fuel back for reprocessing into MOX. South Korea would like to own these fuel contracts. Also, South Korea wants to pursue development of pyroprocessing of spent fuel which mixes plutonium with other elements making it much less accessible for bomb making purposes. The method would significantly help South Korea deal with its own spent fuel inventory. As of October 2014 is has a reported 9000 tonnes in temporary wet storage. More recently, South Korea announced a cooperative relationship with Argonne National Laboratory to build an updated version of the sodium cooled Integral Fast Reactor. It can burn a uranium metal fuel that requires advanced technological capabilities. Diplomats from both countries told the South Korean English language news media they will keep talking and that no artificial deadlines will impede the negotiations. The UK government moved ahead this week with the process of approving the GE-Hitachi 1350 MW ABWR reactor under the generic design assessment (GDA). The design is in the the third and final stage of the GDA. Ed Davey, the UL Energy Minister, made the announcement to the House of Commons on Dec 11. . The ABWRs are slated for two of the UK’s new build projects with two units each at Wylfa and Oldbury and both projects under the heading of the Horizon project. Horizon is a 50:50 new-build joint venture of RWE power with E.ON UK which are German firms. The GDA for the ABWR’s is expected to be completed in 2017 with first concrete poured two years later. Interesting point about the relationship between construction of Kudankulam 3 & 4 and the Indian nuclear liability law. I suppose that Russia could in principle accept all liability and build it into their cost of construction. Another consideration is whether the strong public opposition to the first two units will continue creating sufficient delays such that the nuclear liability issue will have been long resolved prior to actual operation of the newer units.